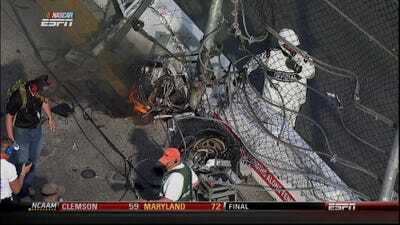 20-year-old Kyle Larson was the driver of a car that went through the catch fence. The front end of the car was completely ripped off, and you can see the engine fly out toward the stands. ESPN’s Marty Smith reports that Larson says he’s OK.
Tony Stewart won the race, but wasn’t in the celebrating mood. His concern was for the other drivers. “So as much as we want to celebrate right now and as much as this is a big deal to us, I’m more worried about the drivers and the fans that are in the stands right now because that was … I could see it all in my mirror, and it didn’t look good from where I was at,” Stewart told the Associated Press.